Increased television exposure has catapulted the sport of darts back into the nation’s consciousness, with attendances and prize money soaring. Darts professionals are finally getting the acclaim and recognition many feel their unique skills deserve. The top players, still disappointed at being denied the opportunity to showcase their talents at the 2012 Olympics in London, are pushing each other to new Olympian heights – even if the IOC continues to turn a deaf ear. The snobbery and prejudice have slowly been broken down, despite howls of derision from exponents and lovers of certain more established sports. It is certainly a golden age in terms of performance, popularity and panache. The third in line to the throne was even spotted mingling at this year’s PDC World Championship. Adrian Lewis, managed to find time to give Prince Harry a hug and a smooch as he left the oche with the PDC World Championship trophy tucked under one of his burly forearms. Breaking into the world’s top 16 has never been harder with an greater talent pool and averages rising as rapidly as a Dubai skyscraper. The week before a major tournament, a modern player is more likely to be found pounding a treadmill in his local gym than propping up a bar. Much of the modern success is down to the colossal talents of 15-times world champion Phil Taylor and five-times don Raymond van Baarneveld. The star duo’s deeds have forced others to raise their performance levels and work rate just to stay in touch. “The King”, one of the heaviest scorers in the business, is somewhat misunderstood and has attracted some unwarranted negative headlines in the past with his game-day intensity being misconstrued as aloofness. Don’t believe the hype. An ever-present in the world’s top ten since he joined the PDC in 2007, King is one of the most articulate and approachable men on the circuit. Like golf, in which the professionals work intensely on the range or make swing alterations, the game can never be truly mastered. Subtle alterations are made to technique and equipment as players crave consistency and excellence. Professional darts is a continual work in progress. The 45-year-old from Norfolk goes into next month’s Sky Bet Mobile World Matchplay in Blackpool – considered by many the biggest event outside the World Championship – full of confidence, hoping to end a mini-slump in form that coincided with his father’s death last year. 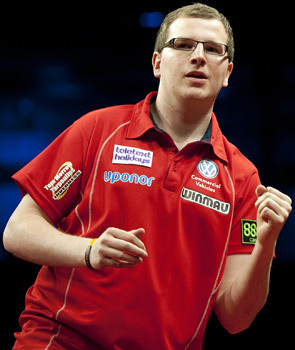 One of the new breed of dedicated young professionals, Mark Webster, the BDO world champion in 2008, has always saved his best performances for the Worlds. Since switching to the Barry Hearn-run PDC, the 27-year-old Welshman has added to his impressive resume with back-to-back semi-final appearances at Alexandra Palace. Webster’s debut season in the Premier League did not go to plan, as he struggled to find his true form. He averaged an astonishing 110 in Exeter as he brushed aside Lewis, but admits that, overall, he did not do himself justice. “I enjoyed it, but I found it difficult obviously,” he said. “I learnt an awful lot. Unfortunately I had to learn the hard way. It was a big step up, but I know I can compete with the top guys as I proved on occasions. Fans, many of whom feel priced out of watching Premier League football, are turning to darts in their thousands. Webster, like the majority of his peers, performs many exhibition matches each year in small intimate venues as club players get the chance to see their heroes up close. The whole sport feels incredibly grounded; no prima donna would survive for long on tour. Reaching the summit of world darts is a difficult, long, lonely pursuit. Hours of daily practice is required as skills are honed and shots mastered. Webster tries to keep his sessions as interesting and varied as possible. The leading British players are still the men to beat, but darts has become a global game in recent years. Holland’s Van Baarneveld and popular Canadian John Part, a world champion on three occasions, were the pioneers who broke Albion’s stranglehold on the sport. Others are desperate to replicate their success. The PDC Order of Merit is littered with players from the Netherlands. ‘Barney’, Vincent van der Voort, Co Stompe, Jelle Klaasen and Michael van Gerwen are all currently ranked in the world’s top 32 . With the Dutch hosting more and more professional tournaments, like the RTL7 International Masters held in Egmond Aan Zee in March, the game there is blooming. Australia’s Simon Whitlock and Paul Nicholson have also emerged as serious contenders for the major prizes. Whitlock reached the 2010 PDC World Championship final, only to run into Taylor at his imperious best. The “Wizard” was unfortunate not to emulate compatriot Tony David, another international world champion, who was crowned BDO king in 2002. Nicholson, who wears a dapper skinny tie during matches, showed scintillating recent form in beating Premier League champion Gary Anderson and Taylor at the Speedy Hire UK Open Finals in Bolton. The United Kingdom can no longer claim outright sovereignty like it did in the heyday of Eric Bristow, John Lowe, Jocky Wilson, Taylor et al. However, unlike snooker, the sport has reinvented itself successfully this past decade to ride a wave of popularity that shows no signs of stopping. Superbly well written darts article and great to see darts being taken more seriously. In such hard times as these with Golf memberships at over £90 per month people forget just how skillful and challenging that darts can be as an alternative. Hopefully will help inspire more to play or try the game. The comparison with golf is a fair one. Lots of overweight club swingers like Clarke, Westwood etc don’t get half as much stick as the darts boys. Board aiming or flag aiming its all bloody hard. Good to stumble across a darts article without Phil Taylor being the spokesman. A very well written interview and with darts being second only to footie on Sky ratings the sport’s never had a higher profile. More interviews here and if you’d like a reciprocal link back please feel free. Brilliant. You got some great stuff from Merv and Weby, two players I really respect. Newspapers and general sports websites don’t give our sport enough credit at times. Well researched and a shot in the arm for arrows nuts. I would love a transcript of the full interviews if you have time. Stumbled across this and really enjoyed it. The NBA also impressed me. Nice to see a U.K site not obsessed with Football and Cricket. Not sure Merv is being a realist. His form is bad, real bad. Top 10 ranking will be a thing of history soon unless he finds a new lease of life. Great article – not just because you’ve linked to my site Good to see darts being talked about in more and more places. It is great to see darts being written about and mentioning other players apart from PT. It is just a shame many people still don’t see it as a sport, and where I firmly believe they are wrong. I was not good at very many sports when I was young but my brother convinced me to give darts a go, and I found out I was not half bad. My confidence was greatly improved after winning my first trophy and this was all possible to picking up my first set of darts. Excellant article and it is good to see that more people are taking an interest in darts, all these guys are genuine on the circuit and they need to perform week in and week out to maintain there seedings, it is not just done in the TV tournaments. Prize money is greater in the TV tournaments but all the players play on the circuit most weeks at floor events or exhibitions and they have a very busy schedule and keep themselves both physically and mentally fit. There are an extremely lot of goods players playing this sport now and it is great to see them progress and get better, there is an initiative going at the PDC floor events for volunteer markers and anyone that is capable of marking and would like to see these guys close up are more than welcome, visit http://www.dartsfreak.com for more info. The fact the UK can’t “claim outright sovereignty like it did in the heyday of Eric Bristow, John Lowe, Jocky Wilson, Taylor et al” is surely a good thing. The sport will become increasingly popular worldwide and enables those physically less athletic to take part in game of skill and tactics. Great news to see darts making a resurgence. From personal experience, our website has never been busier. The community of genuine and knowledgeable fans is just growing and growing. This article is just what the sport needs right now and I found it well written and informative. Our forum is http://www.thedartsforum.co.uk come and check us out, theres always something happening, we are a family friendly forum and everybody is made welcome. Always great to see good darts articles. It’s a great sport and deserves more coverage. Cheers. Hi Sean, on the Stars of Darts site you mentioned a few quotes that got left out after the sub-editing process. I’ve stated them here and I think your chief editor would be well advised to merge the existing part abouot Merv’s father with the part that has been deleted, as the demise of Merv’s dad had played such an important role in his life and caused the downfall in form and on the Order of Merit, which I understand as I lost my dad shortly before Merv did and i’m still devastated about it. A good job and an enjoyable read…here hoping to see more. Brilliant stuff. The PDC does not stand for “Phil Darts Club”. There are lots of top players us fans want to hear from and you gave us two of my personal favourites. Webby’s honesty about his Prem League nightmare was great. He is good enough to get back in and do himself justice, trust me. Merv is Merv, complex confusing but sensational on his day. I hope both men come out firing at blackpool. An excellent article. Well written and to the point. Couldn’t agree more about Mr King he really is a top man with a wicked sense of humour. Always interesting to read articles that give us fans a bit more of a background into the players. A good and enjoyable read. A brilliant read!It is very intense and yes more people should sit up and watch and read. Darts is getting harder & harder (for the professionals) to keep in the top 16 (let alone top 32). Indeed new blood is needed, it is coming from the new players on the circuit but like those consistantly in the top 16 they will have to apply themselves as it will be thier reward. Darts is sllowely winning over the other indoor sports & I do beleive that it wont be long before we see Darts at the Olypmics! You may get a golfer practicing putting for 2 hours, but get them to match Simon Whitlock doing 8 hours of practice ONLY on combination finishes! THAT is commitement and mental strength. Thanks for “Great” write up , darts needs all it can get in the world of sports entertainment . It’s great to read a well-written piece on darts that shows understanding of the sport. It’s a shame that the IOC hasn’t recognized darts yet still holds on to some others. This really should have changed with the Olympics being in England, but hopefully soon. Watching the Premier League, it’s easy to see just how good the top players are. When Phil Taylor gets booed when he misses a 3rd perfect game in the same match, it shows just how high the level of darts is. Let’s see Tiger Woods hit three hole-in-ones in the same round of golf. Darts should be in the Olympics,no arguements. Better tv coverage in Australia on free to air would be great too. I´m an ex pat living in Spain and the darts draws the punters in like nothing other than football. It is the only working mans game left. Footballers are millionaires who are quite remote. My holidaymakers can relate to the darts boys. Approachable and friendly and keen to chat to people when they holiday here and I´ve had lots of pros and former pros in my pub. Great sport played by great, friendly people. I so enjoyed “Boardwalk Empire” when I found it linked on my favourite darts forum. The Matchplay at the Winter Gardens will pack my place out and I wish you all the best with this intelligent website. Hoping for a Merv King comeback and Blackpool run to the semis at least after reading this. Darts writing is usually a few paragraphs in the red tops. This was welcome as we don’t always get catered for. I an’t wait for the Masters at Blackpool and Webster is due a good run. Williams sisters story marvellous too people. A very well written article. It is nice to see that the sport of darts is getting more attention. Although darts are not as popular in Canada as in the U.K., the sport is growing in popularity. Hopefully it will gain enough popularity to be included in future Olympics.